Way back on the 8th day of this year, I made a Nuts and Bolts Trail Mix in the crockpot. It was delicious, and we ate it straight for two days. Since then, General Mills has re-formulated Rice Chex cereal to make it Gluten Free. Which rocks. It overjoys my mommy heart to know that every single grocery store will carry a tasty, affordable cereal--a cereal that can be found when traveling, and something grandma can easily pick up to keep on hand. For a while, some stores had the old version on the shelves until they sold out. If you are picking some up at the store, make sure it has the Gluten Free label. This is actually the 4th or 5th time I've made Chex Mix in the crockpot with the new cereal---I kept forgetting to take photos. This is so very easy to throw together for an after-school snack, for a boring Sunday afternoon, etc. I love that I'm not heating up the house with the oven or monitoring closely, worried about burnage. --put the butter into the bottom of your crockpot. Dump out onto a cookie sheet to cool. We ate every last ounce of this in one day. It is seriously addicting. The kids liked it immensely, and have requested me to make it again today. The recipe that I have written here has less butter than the original Chex Party Mix recipe, and I was pleased that it was still enough to coat the cereal, peanuts, and pretzels nicely without a layer of grease left on my hands. because then the couch stays clean. Just a note to tell you how much I love your site. With school starting up and working full time, plus having three kids at three different schools and working (kids are in local and private schools) 20 miles from home, my crock pot is my best friend. I will be using bunches of your recipes from your site. Please keep them coming!!!! I also wanted to say that I LOVE your site. I'm also a teacher, and have had the luxury of searching for good recipes while home during the summer, and this site is a gold mine! I've made a few things and they have turned out great! I'm excited to have this site to look for at the end of long days wrangling highschoolers! mmmmmm What size crock did you use for this? So triple-yeay!! Some gluten free crockpot recipes. Thank you. Thank you. Thank you. Keep 'em coming! YEA Chex Mix in the crock pot!!! I'm already hooked on this stuff and can't wait to make it this weekend! Thanks for another great recipe! I'm so excited about this!! We LOVE Chex Mix, but you're right - it's a pain to have to stir every 10 minutes and heat up the house with the oven. Crock Pot Chex Mix - PERFECT!! Thanks! I love making this with the raw almond's from Trader Joes- it's way better than peanuts. We have a peanut and milk allergy (did I mention the egg allergy) in our house! :) Do you think I could make this with almonds? I loved chex snack mix growing up and I know my kids would love it. We just never buy because it has peanuts. Oh how exciting! I'm trying this one for sure! I know I say that about the majority of the recipes you post (and like), but I'm really serious about this one. Really. We also have nut issues, I use pumpkin seeds (pepitas) or sunflower seeds instead of the nuts and it works great. I just loaded up the crockpot to give it a whirl as if I can make this in there, it will be our new go to snack! Thanks! Mmmmm I love chex mix. That's why I don't buy it or make it. I'll eat it all! I'm making this for our camping trip next weekend...thanks! I am also GF, so I appreciate that you have already modified the ingredient list! I CANNOT believe this. Just yesterday I made Chex Mix, because we, too are a gluten free family, as four of the six of us have Celiac and I also recently learned of the Rice Chex ingredient change. Finally. How many cereals would also be gf if they would JUST do AWAY with the BARLEY MALT...? Anyway, I made mine the old fashioned way, in the oven, because using my crock pot didn't even cross my mind. Next time I make it, it will. Thanks Stephanie for this great way to make Chex Mix. I was already thinking of making a big batch for a pool party next week, and this will be so much easier. Also a tip for those with little ones: when i make it for a preschool snack, i cut back on the spices. I find it still has enough flavor for them, but does cut back on the sodium content. If I am feeling generous, I will add m & M's, green and red for Christmas, etc. Your site is now the first thing I check each morning, right after my own blog! Wow! 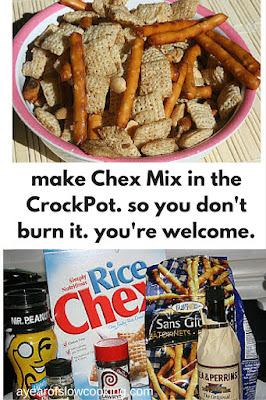 I love chex mix and never make it because of needing the oven and because GF cereal is SO expensive. Yay! for rice chex being GF!!! and thanks for this recipe! Great idea! I use my crockpot on average once a week. It's usually a main dish, though. I like your desserts and snacks! Has anyone tried this with some Mrs. Dash instead of the seasoned salt? We are trying to cut down on salt. But LOVE the idea of doing it in the crockpot. MY MOM USE TO MAKE A MIX WITH BUGLES AND CHEX AND I WILL HAVE TO HUNT IT OUT. I LOVE TO EAT IT BUT HATED TO MAKE IT. WILL HAVE TO TRY THIS. WE HAD THE HOT AND SOUR SOUP , I ADDED MORE VEG., AND THIN STRIPS OF BEEF AND IT WAS ALL ORGANIC. A super yummy twist on Chex mix is to use taco seasoning. Mix together a packet of taco seasoning with 3 tbsp. oil and 2 tbsp. water and poor over your favorite munchies -- I like pretzels, chex, corn chips and peanuts. Then bake or crock it like any other mix. Ole! mmmm this sounds amazing and so easy! 1) What is seasoned salt? 2) We don't have Chex in Canada, what could I use instead? Shreddies? Cheerios? Any similar kind of cereal? Cheerios would work! So would cornflakes or any other boring cereal that has a good crunch but not too much flavor. I found your site when looking for a lettuce wraps recipe. I think it is hilarious!! I am gonna bookmark your page because I love cooking in my crockpot. Can't wait to try out some of your recipes!! 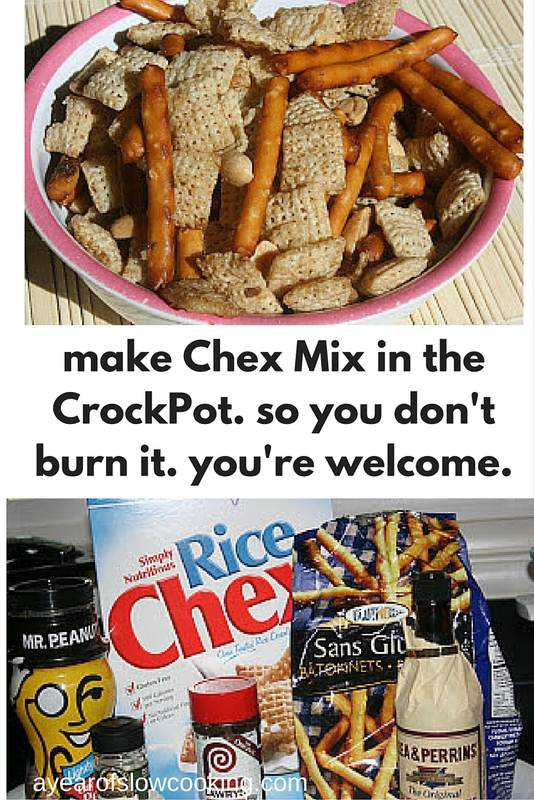 Love Chex mix and have never thought to do it in the crock pot. I also live in Canada where we do not get chex cereals so I used a combination of crispix, shreddies and multi grain cherrios. I saw a recipe for this in the Slow Cookers for Dummy's book and was intrigued by it. I wasn't 100% certain what a Chex was! I don't think I have seen them here in Australia, or at least not in my part of the country. But it does remind me of the age old classic Nuts and Bolts made with Nutri Grain cereal (hence the bolts) and similar ingredients list. I just can't imagine waiting 2-3 hours for Chex! My husband and I make Chex in the Fall and not only can we not wait an hour, we have been known to eat an entire batch in one night, I'm not kidding. On a serious note, I love your blog and wish I had time to check it more often. Question: does it stay crunchy? I would think all the moisture from the melted butter would stay in the crock pot and make everything soft. I'd love to try it but I'm scared it'll turn out mushy. Hi Janelle, I was worried about that, too! Once everything cools off, it's nice and crunchy; just like in the oven version.